As some major economies cut their corporate tax rates - what will happen next? The US is not alone in its push to lower corporate tax rates. Last month, US President Trump signed a major overhaul to the US tax code. The centrepiece of that plan is a reduction in the headline corporate tax rate from 35% to 21%, along with a reduced repatriation tax rate for foreign income on “high profit returns” (such as intellectual property) when those profits are brought back into the US. 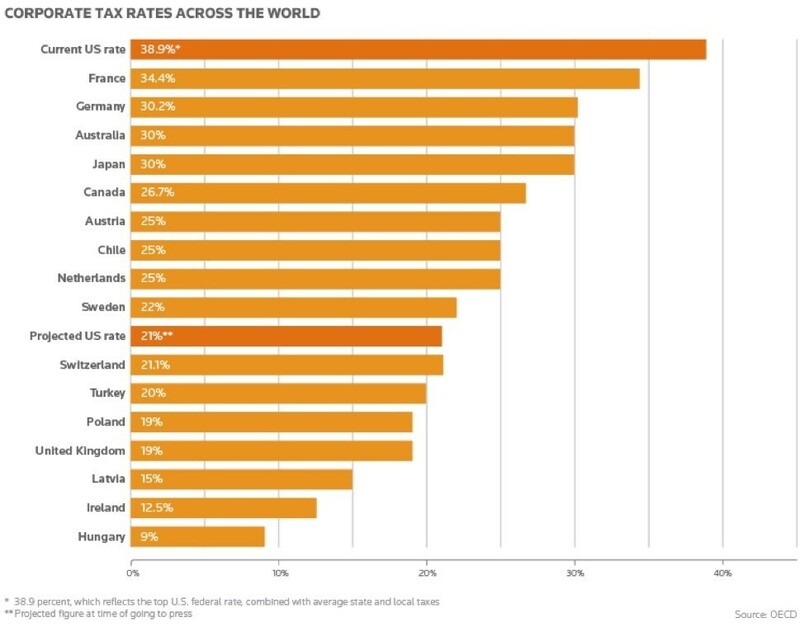 This puts the US corporate tax rate – previously among the highest in the world – square in the middle of the pack among the 35 Organisation for Economic Co-operation and Development (OECD) countries, wedged neatly between Italy and The Netherlands. It is worth noting that the US is not alone in this push to lower corporate tax rates. In fact, the top three countries with the highest corporate tax rates in the OECD – the US, France, and Belgium – have all introduced proposals to lower their corporate tax rates in a bid to make their regimes more competitive in the global marketplace. This all begs the question: have we entered a race to the bottom? Not long ago, the bulk of the public discourse on corporate tax was focused on the issue of transfer pricing and corporate inversions. These are tax practices that allow a corporation operating in a high tax regime – like the US – to lower their effective corporate tax rate by shifting their profits into countries with lower tax rates. This can take the form of relatively simple steps, like moving key intellectual property and employees to a low-tax country, such as Ireland (12.5%) or Switzerland (8.5%), or more extreme measures like merging with a foreign firm and claiming that company’s low-tax home base as the new corporate headquarters. US corporations have come under intense scrutiny for these practices. The issue reached a fever pitch in July of 2014, when President Obama introduced a series of new tax rules designed to stop tax inversions, calling the companies using these tactics “corporate deserters”. Despite the public shaming, US corporations have continued to shift profit overseas and keep it there to avoid paying steep tax rates on repatriated income. The new tax reforms are designed to fix this issue by leveling the global playing field. However, getting to that level playing field is not quite as simple as just lowering the corporate tax rate. For one, few US corporations actually pay the full 35%. A new report from WalletHub finds that the average corporate rate paid by companies is roughly 27%. Add the details of how the US tax reforms will be implemented, how they correspond with global tax reform initiatives – such as those introduced by the OECD in its Base Erosion and Profit Shifting project – and how they impact each company’s individual tax plan, and it’s easy to see where a low corporate tax rate alone may not be enough to significantly alter the global tax map. Even the proposed territorial taxation scheme, which would allow US companies to repatriate all of that foreign income at a lower tax rate is not as simple as the various economic models might suggest. For example, most of the $2.6 trillion in cash US companies currently have parked offshore is governed by a longstanding accounting rule called APB 23, which allows a US multinational to assert that its investment in a foreign subsidiary is permanent and those foreign earnings will be indefinitely reinvested so there is no current or deferred incremental US tax liability. To meet the standard, companies need to be able to demonstrate that the cash is not needed at home and can be successfully deployed abroad, either through local expansion or overseas M&A transactions. So, a sudden decision by a company to bring all of that cash back into the US could raise some questions about the company’s previous assertions that it would use that money for overseas transactions, ultimately making the repatriation idea a lot less attractive. Likewise, all of the transfer pricing strategies US companies have implemented to reduce their exposure to the 35% corporate tax rate are typically associated with a physical presence in another country and various commitments to that local government. The point is, corporate tax is not as simple as the headline tax rate may suggest. Pull one lever in the US and 10 more will need to be adjusted in Europe. Change the way certain services – like streaming media or cloud-based software – are taxed in any one city, and several more changes will need to be made to adjust to that new dynamic. Like every tax reform proposal before it, the new US plan will spur endless conjecture about winners and losers and potential knock-on effects for other countries who may be tempted to lower their taxes even further to compete, but tax is not really a horse race where the lowest rate always wins. A multinational corporate tax strategy is an immensely complicated endeavour, one that factors a host of variables, including global trade requirements, location of customer base, location of talent, and corporate tax rates in an elaborate balancing act. Do corporate tax rates matter? Yes, absolutely, but it’s important to remember that they are part of a much larger strategic mix, one that will not change overnight.